New descriptions of the infamous Russian-bought politically themed ads on Facebook shared with CNN suggest at least some of the ads were working at cross purposes on a range of issues. Sources with knowledge of the ads tell CNN that they ranged from posts promoting gun rights and the Second Amendment to posts warning about what they said was the threat undocumented immigrants posed to American democracy. Some ads promoted Black Lives Matter while others decried it, as the Washington Post reported Monday. The apparent goal of the ads, the sources who spoke with CNN said, was to amplify political discord and fuel an atmosphere of incivility and chaos around the 2016 presidential campaign, not necessarily to promote one candidate or cause over another. Senate Intelligence Committee chair Richard Burr, a Republican, told reporters Tuesday that the use of Facebook and other social media platforms by Russian-linked accounts appears to be about creating chaos on both ends of the political spectrum, not necessarily collusion between the Trump camp and Russian officials. "Listen, I've said I don't think this is about collusion. Facebook is a company that most advertisers rely on Facebook's information to determine what the target is," Burr told reporters. "I think clearly there was an effort to bring some chaos to groups on the right and the left, so there's nothing that, at least preliminary, would lean toward one candidate versus the other. I think there was equal money sent trying to create some type of chaos on both sides of the political or ideological spectrum. We'll find more as we go in." 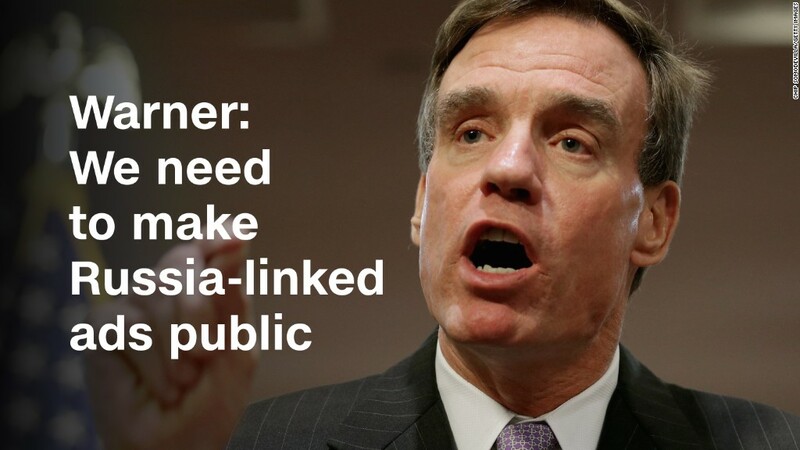 Burr and Sen. Mark Warner, the top Democrat on the panel, said they had not seen the Facebook ads sold to Russian-linked accounts as of Tuesday afternoon. Burr also said he doesn't want the committee to be the one to make the ads public when they are handed over by Facebook. "We don't routinely release any information that's shared with the committee and I'd like to keep the committee in that mode," he said. Facebook's chief security officer, Alex Stamos, said in a statement earlier this month that "the vast majority of ads run by these accounts didn't specifically reference the U.S. presidential election, voting or a particular candidate." "Rather," Stamos said, "the ads and accounts appeared to focus on amplifying divisive social and political messages across the ideological spectrum -- touching on topics from LGBT matters to race issues to immigration to gun rights." Warner, the top Democrat on the Senate Intelligence Committee, said this week that the aim of the ad-buyers "was to sow chaos." "In many cases, it was more about voter suppression rather than increasing turnout," he told reporters. Facebook has already handed over copies of the ads and information about the relevant accounts to Special Counsel Robert Mueller, who is conducting an investigation into Russian meddling in the 2016 election. It is expected to give the same information to the Senate and House Intelligence Committee later this week. Still, for Congress as for the public, many questions remain. Facebook has not yet revealed where or how the ads were targeted -- that is, what kinds of people were shown the ads, or where they may have lived. To date, the company has only said that one quarter of the ads were geographically targeted, but they have not disclosed specific locations or said anything about targeting based on demographics or interest groups. Related: Facebook is planning big changes to political ads on its site. Are they enough? The targeting issue is especially important because, if it appears that the targeting was particularly sophisticated, there may be questions raised about how the Russians knew where to direct their ads, and information about the targeting could help investigators determine whether or not there was any collusion between these ad buyers and the Trump campaign. Meanwhile, the disclosure that Russians used social media advertising to meddle in American politics has brought new scrutiny on the big tech companies. That scrutiny has forced tech leaders like Facebook CEO Mark Zuckerberg to change their public stances regarding social media's role in the 2016 election. In the days after the election, Zuckerberg said it was "crazy" to think that fake news on Facebook played a major role in the outcome of the election. As the Washington Post reported Sunday, Zuckerberg even downplayed the issue after President Obama personally appealed to him last November to take the threat of fake news seriously. Now, Zuckerberg is promising a number of changes to the platform to prevent foreign nationals from influencing future elections. Last week, he announced that future political ads will include a disclosure about which Facebook page posted them, and visitors to that page will be able to see all the ads a group has run on the platform. Zuckerberg said Facebook is also strengthening its own review process for political ads, which are often bought through Facebook's automated system without any interaction between buyers and Facebook employees. The company is adding 250 more people to its election integrity team, expanding its partnerships with official election commissions around the world to flag risks, and looking into ways of sharing similar information about bad actors with other tech companies. It is also looking into expanding its anti-bullying system to political harassment.